Results for fourth- and eighth-graders in the 50-state test were relatively flat since the last tests were administered. Maine students scored above the national average in math and reading on the latest National Assessment of Educational Progress test, according to results released Thursday. The test, which was given to a representative sample of Maine students from January to March, is the only exam that allows comparison of students’ performance across states. In math, 47 percent of Maine’s fourth-graders scored “proficient or better,” compared with 41 percent nationally. Forty percent of the state’s eighth-graders scored “proficient or better,” compared with 34 percent nationally, according to the National Center for Education Statistics. In reading, 37 percent of Maine’s fourth-graders scored “proficient or better,” compared with 34 percent nationally, and 38 percent of Maine’s eighth-graders scored “proficient or better,” compared with 34 percent nationally. The state’s top academic officer said it’s good that Maine did well nationally, but noted that New Hampshire and Vermont did better in both fourth- and eighth-grade math. “I would hope that we’re on an upward trajectory,” said Rachelle Tome, chief academic officer in the Department of Education. Scores should improve as new teaching models and school improvements are made, but that process can be long, she said. Maine’s scores improved in two categories from the 2011 results. Average fourth-grade reading scores rose the most, from 222 to 225 points, and average math scores went up slightly, from 244 to 246. Eighth-grade math and reading scores held steady. Scores were calculated on a total 500 points. Maine students’ test scores can appear inconsistent. The National Assessment of Educational Progress results, for example, show Maine’s average scores in eighth-grade math ranked 15th in the nation. 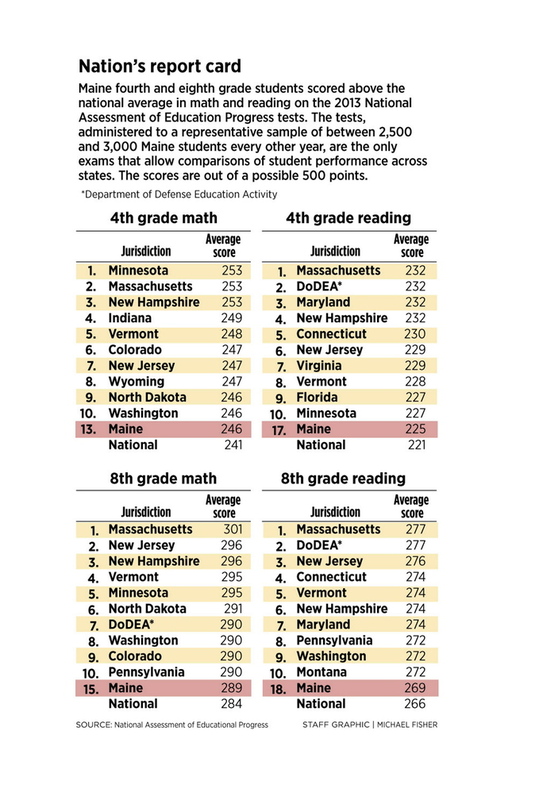 But just last month, the same testing agency said Maine ranked seventh in the nation in eighth-grade math, based on results from the 2011NAEP results when results were essentially the same. Maine’s assessment tool is the New England Common Assessment Program test, which is given annually to all third- through eighth-grade students. A comparison of the national NAEP and the state NECAP tests and scores isn’t possible because the definition of what meets grade-level expectations isn’t the same. For the New England test, “proficient” is considered grade-level work. On the national test, a score of “proficient” reflects work above grade level. Also, the two tests are conducted very differently. The New England tests are given annually, and are spread over several days. The National Assessment of Educational Progress tests only a representative sample of students. In Maine, the testing pool is about 2,500 to 3,000 students for each test. The testing takes less than an hour because each student is given only a few problems from any one test. The math and reading test is given in odd-numbered years, and tests in other subjects, such as science and writing, are given in even years. The National Assessment of Educational Progress is affiliated with the National Center for Education Statistics, part of the U.S. Department of Education. U.S. Education Secretary Arne Duncan said Thursday that the test results are “encouraging but modest” nationwide. He noted that eighth-grade reading scores are up after being flat for the past decade. Duncan credited education reform efforts for boosting scores dramatically in some states, including Hawaii, Tennessee and the District of Columbia. Duncan noted that Maine is one of eight states that had adopted Common Core learning standards at the time the test was given. The standards, which spell out expectations for what students should learn in each grade, have been adopted by the majority of states.